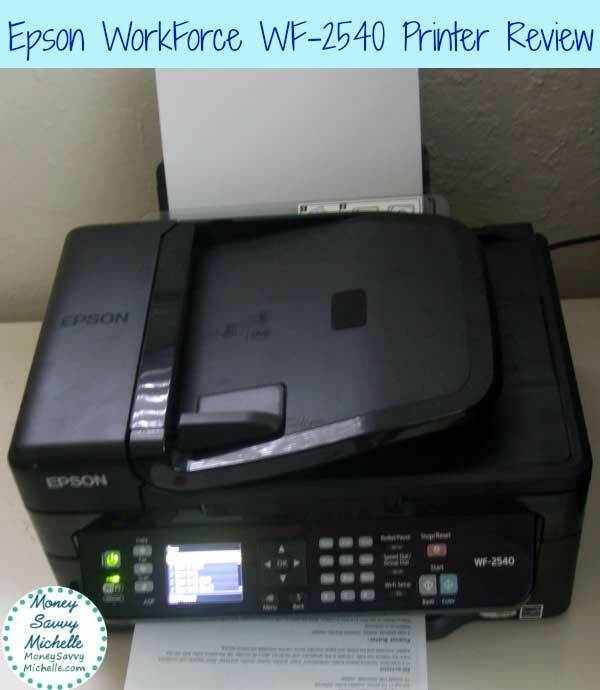 My Experience with the Epson WorkForce WF-2540 Printer: I’ve been shopping for a printer for some time now, but hadn’t found one I really wanted to spend the money on. I wanted something that could print documents as well as nice looking photos, but also be able to scan and make copies for my business. As I said before, my current printer is a mammoth, so I also wanted one that could get all of those tasks done without being huge. Lastly, it was really important to me to have each printing color be in its own cartridge to save money, and wireless would be a plus. I feel like I waste a lot of money having to buy a whole new cartridge with all 3 colors when 2 are nearly full and only one is empty. I’ll admit that when shopping around for a new printer, Epson wasn’t a brand that immediately entered my mind. However, when I saw all of the features of the Epson WorkForce WF-2450, I was quite impressed. When I opened the box to unpack the printer, I was pleasantly surprised with several items to get started including ink, printer paper, power and phone cables and the manual with installation CD. Please note that this printer does not include a USB cable, but since it’s wireless or can be connected to your router with an Ethernet cable, you really should not need a USB cable anyway. I have to admit I was kind of shocked at just how much tape was on and inside the printer. On the other hand, it’s always good to know that the printer is packed securely so pieces don’t get knocked out or broken during shipping. 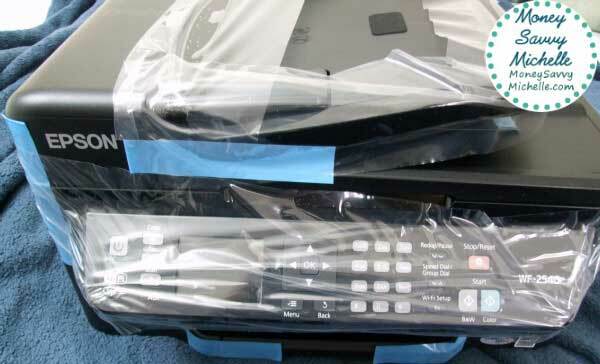 I do think, however, removing all the tape took longer than setting up the printer itself once it was powered on. Setting up the printer was easy. Just plug it in (so nice that it only weighs 13 pounds – I think my old printer could be used in a weightlifting routine), turn it on and set up the initial items like time, date, country, and language. Then install the cartridges (it does take about 4 minutes for them to initialize the first time) and add some paper and connect the printer wirelessly to your router (from your pc or the printer itself), via ethernet, or USB and you’re good to go. There is also a CD with drivers you can use, but I just used the Windows 7 functionality, where I had no issues with compatibility even with self-built computers and brand laptops. Since I tend to print a lot of lists and coupons and scan contracts, I like that the paper reserve holds 100 sheets and that there is a button on the printer to easily print in color or black ink to save on cartridges. I do kind of wish that the paper feeder was horizontal rather than vertical to help with dust, cat fur, etc. not getting inside, but hopefully that won’t be an issue. After getting everything set up, I immediately printed out my grocery list I had been compiling and it was printed in seconds. I also installed the Epson app on my Android phone and was able to print a recipe I wanted to try for dinner without even being close to the printer. I then installed the printer on my laptop and it worked flawlessly as well. I love that I can be anywhere in the house to use the printer – or not even at home for that matter – and the printer itself doesn’t even have to be directly connected to a computer. That means even though our office is upstairs, I can actually have the printer connected downstairs to grab coupons, lists and other important papers as we’re walking out the door! Or I can be surfing the internet anywhere in the house for new recipes to try and immediately print them instead of having to email myself the link to print later. The print quality is great and I can’t wait to try printing out some photos. The only other feature I wish it had was 2-sided printing without having to put the paper back in manually, but that is a feature I rarely use anyway. 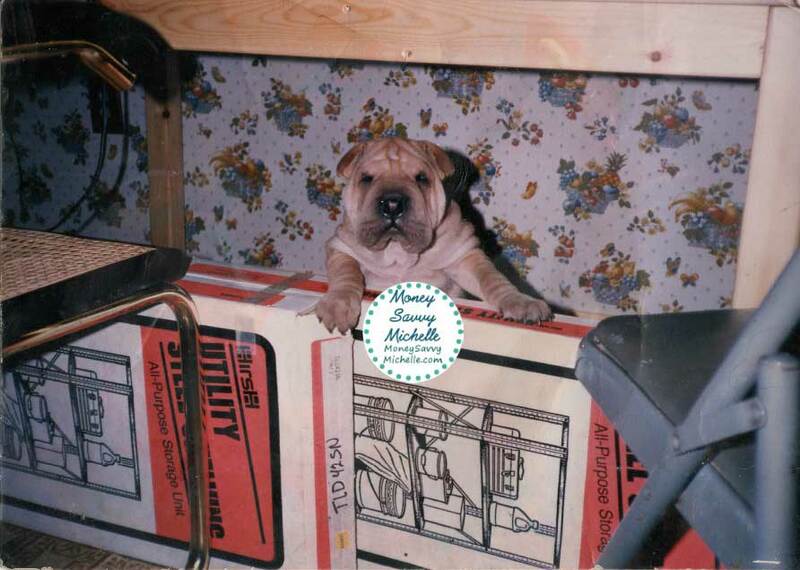 I scanned some old photos to help preserve them as they age, like this photo of the boyfriend’s childhood dog. I think the printer did a great job of scanning with a nice resolution and quality. Even though I didn’t have the printer connected to my PC, all I had to do was insert an USB flash drive in the USB slot that’s conveniently in the front to save the scans. You also have options to save to the cloud, etc. 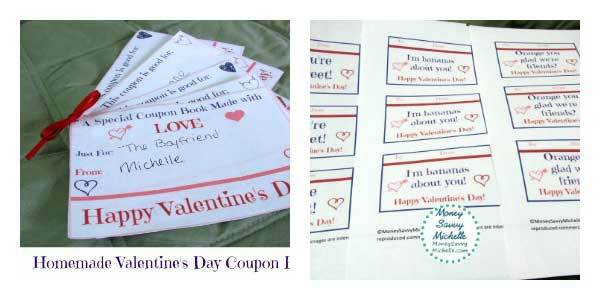 I also used the printer for a couple of my Valentine’s Day gift ideas, my custom Valentine’s Day coupon book and cute food valentines ideas, to really see what the quality was like since the text was in different colors with different fonts, along with some icons. I was impressed that they all printed out quite legibly and looked great so that I feel good about using them in gifts to give to others. Final Takeaway: Even though this printer lacks a couple small features I would have liked, all the features it does have far out weighs anything missing, especially the convenience of a wireless printer. I look forward to hopefully using this printer for years to come after having really enjoyed using it for approximately a month as of this review. I also have been trying to get more organized this year, and the printer has done wonders to allow me to print my receipts and also scan them for an electronic copy for my business! Buy It: The Epson WorkForce WF-2540 All-in-One Printer is available for $89 at Amazon.com as of 1/16/13. 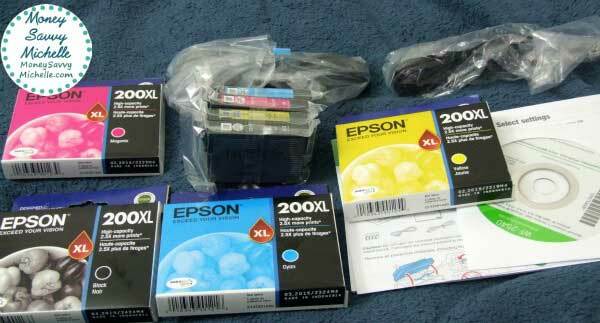 About Epson: Epson produces a number of products such as printers, projectors, scanners and more. Visit Epson.com and follow Epson on Twitter for more information. I received the above product in exchange for an honest review. No other compensation was received. All words and opinions in this post are solely my own. I have been using WF-2540 Printer for 2 years now and it’s still produces impressive photos. I love you blog. Nice post!.